Every iPhone 4S owner is excited about yesterday’s untethered iOS 5.0 / 5.0.1 jailbreak release for A5 devices in the shapes of GreenPois0n Absinthe (Chronic Dev Team) and Absinthe CLI (iPhone-Dev Team) which opens a whole new world of iOS tweaks and customizations. When I jailbroke my own iPhone 4S, one of the first tweaks that I installed from Cydia was BytaFont, an easy-to-use app that allows you to replace the boring stock iOS fonts on your jailbroken device with a few quick taps. 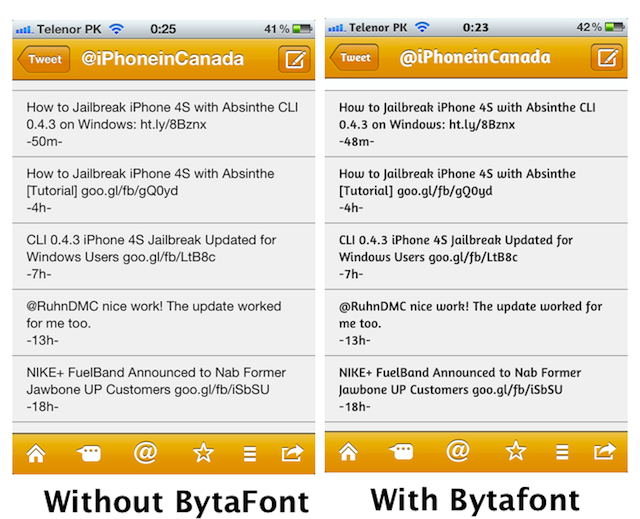 Best of all, the tweak is available for free with thousands of fonts to choose from and is fully compatible with iOS 5.0.1. Looking at the screenshot above, you can get a pretty good idea of how awesome your iPhone can look simply by swapping the stock iOS fonts. To install, open up Cydia and search for BytaFont. After installation, the app’s icon appears on your springboard. You can browse, select and apply your fonts from here. You can select from a huge variety of fonts available on cydia and download them all for free. To do so, simply go to Cydia’s “Fonts” section, choose the fonts you like and install them. To apply, head back to the app, select the installed font and a quick re-spring will dramatically change the look of your jailbroken iPhone 4S.